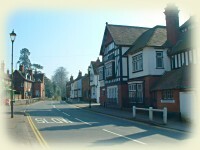 The village of Allesley, although now situated just within the City of Coventry, still retains its separate identity and village atmosphere. 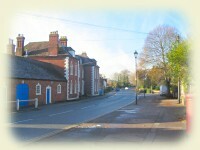 Situated on the western edge of the City, the settlement of Allesley developed along the old coaching road from London to Birmingham and the north. This road, now the A45, forms an important route from Birmingham to Coventry and the increasing traffic led to the by-pass being constructed, which helped to retain the village atmosphere. The surrounding Warwickshire countryside is gently undulating agricultural land consisting of small fields with the occasional copse or small wood.The roads and narrow lanes are bordered by ancient hedgerows rich with different species with many mature trees of oak, ash and sycamore mostly so that from a distance visitors always imagine they are approaching some huge forest. Close to the village many of these fields are now used for keeping and riding horses. For many years Allesley was practically self contained as far as shopping was concerned. Unfortunately for many local people the commercial pressures caused by the opening of several large hyperstores in the city led to the demise of some local trades. The old centre of the village is a Conservation Area and contains several attractively preserved 17th Century cottages and old houses. On the right the Allesley Hotel has huge modern extensions behind this facade which has totally changed its character but the old Rainbow Inn on the far distant right is still beautifully traditional. The wide pavements in the foreground provided space for local cattle fairs in previous times. "Ribbon development" during the 1920-39 period saw houses built along several roads with more than generously long gardens. After the 2nd World War a small municipal housing estate and several blocks of flats (apartments) were built. Then in the 1950's came the first extensive development of green land just at nearby Allesley Park, though separated and distinct from the main part of Allesley Village. The 1960-1980 period saw more residential development in the village consisting mainly of semi-detached houses with some detached ones, bungalows and a few flats. The only industrial activity is the large car assembly factory and offices of Jaguar Cars, about 2 km away. However by 2006 the major part of this car plant had been transferred elsewhere and future use of this huge site is now in question. Due to shortage of land and current Town Planning policies, little development has taken place in recent years. The isolation of Allesley from the rest of the built-up parts of Coventry by the currently protected agricultural land known as "Coundon Wedge" will hopefully be maintained. In the early 1990's many residents' emotions were disturbed by the plans to create a new road splitting this delightful strip of undulating countryside in two, in order to create a new access to the nearby large car factory of Jaguar Cars.